The suspect has both admitted and denied planting explosives at the controversial shrine honoring Japan’s war dead. On November 23, an explosion occurred in a public restroom at Yasukuni Shrine in Tokyo. Police found evidence that a bomb had been planted at the site, and opened an investigation into the explosion as a targeted attack – and potentially an “act of terror,” as Chief Cabinet Secretary Yoshihide Suga put it. No one was injured, despite reports that attendance at the shrine was higher than normal due to an annual harvest festival. After the explosion, police found a digital timer, batteries (with Hangul characters on them), and pipes filled with gunpowder in the bathroom. Some sources say the homemade bomb did not function properly, resulting in limited damage. Yasukuni Shrine is a Shinto shrine dedicated to honoring Japan’s war dead – including (controversially) 14 military officers and political officials designed as “Class A” war criminals by the Tokyo War Crimes Tribunal. As such, the shrine has become a flashpoint in Northeast Asia’s history debates, with Beijing and Seoul protesting vehemently each time a Japanese politician visits or sends gifts to the shrine. Prime Minister Shinzo Abe visited the shrine in December 2013, sparking angry reactions in China and South Korea. Earlier this month, Japanese media reported that the investigation into the bombing was focused on a Korean suspect, surnamed Chon and aged 27. Chon was reportedly seen walking around the shrine just before and after the blast; media reports also indicated his DNA was found in the bathroom where the explosive was planted. There is no evidence linking Chon to any political organizations or groups. Chon returned to South Korea hours after the November 23 explosion, but went back to Japan voluntarily on Wednesday, according to Chosun Ilbo. He was taken into custody upon arrival in Tokyo, on charges of entering Yasukuni for “unlawful purposes.” Japan Times reported that he willingly complied with police instructions, but says Chon told police he returned to Japan not to surrender himself, but simply to “see the restroom” after being interviewed about the explosion by Japanese reporters. Chon had booked a ticket to fly back to South Korea on Wednesday. According to Japanese media, Chon first denied planting the explosives, then later admitted to doing so. 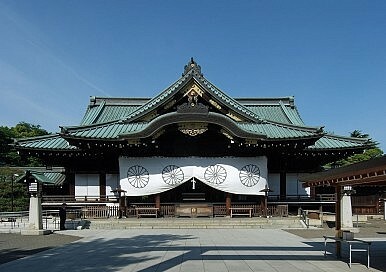 “I went to Yasukuni Shrine and set an explosive. I came to Japan to set the explosive,” Asahi Shimbun quoted Chon as saying, citing police sources. But Chon retracted that confession the next day. Police are continuing their investigation. According to Asahi Shimbun, South Korean officials are worried the case will upset the already-fragile Japan-South Korea relations. “It is bound to have a bad influence on the relationship between South Korea and Japan,” one anonymous South Korean official told Asahi. Still, the case has already caused some bad feelings, with South Korea’s foreign ministry taking Japan to task for revealing Chon’s identity. Suga denied that the Japanese government had anything to do with the Japanese media reports, several of which showed Chon’s photograph in addition to revealing his full name. South Korea “plans to provide [the suspect] with the necessary consular services, keeping a close eye on the results of the Japanese side,” the Korean foreign ministry said in a statement. Just before the meeting, South Korea accused Japan of a provocative flight over a Korean destroyer.